Ever since Sony broke up with Ericsson in their working relationship, it can be said that it is for the better. After all, the new range of Xperia smartphones are definitely more than worth looking at – they will also cater to every different consumer, whether on the low end side of things to the mid-range and at the high end. 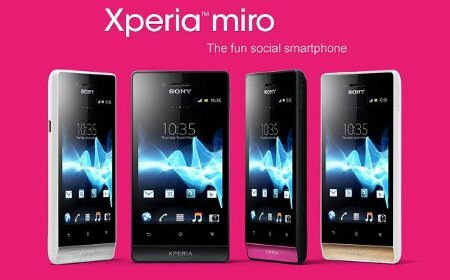 Today, we have a couple more Xperia devices in the pipeline – the Xperia miro and the Xperia tipo. We shall first take a look at the Sony Xperia miro’s specifications as well as what it brings to the table, followed by the Xperia tipo. Basically, the Xperia miro is said to offer deep Facebook integration, and when coupled with Sony’s xLOUD audio technology, it comes in a slim and stylish design that ought to appeal to the masses. You will be able to choose from a wide range of colors, where this particular smartphone sports deep integration of Facebook throughout contacts, photo gallery and the music player. I guess things have really gotten social, no? As for the Sony Xperia tipo, where will be two designs – one with a dual SIM slot, and the other is a vanilla smartphone, and the Xperia tipo will target the more budget conscious folk who do not want to compromise on the aesthetics. Both handsets will be released worldwide sometime in the third quarter of the year, although pricing details have yet to be determined. Check out the bulleted list of the smartphones’ specifications below. AVG Family Safety – Are your Kids Safe with your Smartphone?